↑ 1.0 1.1 Swisher, Curtis & Lewin 2000. ↑ Swisher, Curtis & Lewin 2000, p. 58; de Vos 2004, p. 270. ↑ Swisher, Curtis & Lewin 2000, pp. 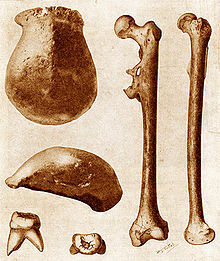 59 ["unorthodox" venture; was refused government funding; hired as medical officer] and 61 ["he was the first person to set out on a deliberate search for fossils of human ancestors"]. ↑ Swisher, Curtis & Lewin 2000, p. 61. ↑ Swisher, Curtis & Lewin 2000, pp. 61–62. ↑ Theunissen 1989, p. 41–43.